You can see some of these examples in the photograph on the left. You can see a list of published material here. I've also had 3 books published - in the main photograph, above - and I'm a member of the Society of Authors. My writing work is very varied; I can write on my own or as part of a team. I am especially skilled and experienced at translating complex material into information for a lay audience - such as older people who are ill and need easily to find out how to access services and get some support. I also write reports for organisations to use internally as part of other work - such as an evaluation of a service, or work developing a service, or consultation with people receiving the services about their experiences and views. 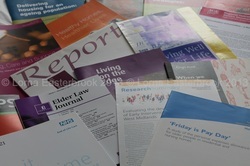 Here are some examples of written work undertaken in 2012 and 2013: a guide to evaluating services for people with sight loss (for the charity the Thomas Pocklington Trust); a guide for Age UK partners on developing hospital discharge/hospital aftercare services (for Age UK); articles for the journals Elder Law Report, and Housing, Care and Support; an essay for ILC-UL on sisterhood and older women (www.ilcuk.org.uk); and sections on paying for care for the Social Care Institute for Excellence's website (www.findmegoodcare.org.uk). In 2013, I completed a social policy paper for the Centre for Research on Ageing at the University of Southampton. In 2014, I developed some materials for local Age UK partners - mostly online - around care navigation services. As well as writing, this included some video and photographic materials. In 2015, I wrote some 'Quick Guides to the Care Act', for Age UK and for NHS bodies (Clinical Commissioning Groups). In 2016, I co-wrote, with Imogen Blood, a report from interviews with people aged 55 and over about their experiences of mental ill health and services, again for Age UK. You can find a list of my published work here. I also have an MA in Creative Writing and Personal Development from the University of Sussex - and I write fiction. If you would like to find out more about my fiction writing, please visit www.lornaeasterbrook.com.